Misinformed people used to complain about the preponderance of video game sequels. They saw video game titles that ended with a number as markers of creative drought. The excellence of Grand Theft Auto III, Super Mario 64, Halo 3, Burnout 3, Call of Duty IV, Mass Effect 2, Assassin's Creed 2 and so many other sequels was a waterfall of inexplicable exceptions. They missed the point that what games do most is what they often do best. Repetition and iteration breed quality in video games like they do in no other form of entertainment. That is a truth that should compensate for the laughable preponderance of a species of games seemingly more popular than sequels: first-person video games, most of them first-person shooters. We are drowning in first-person games. In the time you read this sentence, a gaming executive somewhere probably just greenlit a new one. I was reminded again of the surge of first-person games after the news this week that a new first-person action game called Dishonored would soon be gracing the cover of Game Informer magazine. That magazine has featured five first-person games on the 11 of its covers that showcased new games in 2010 and is up to its third of eight this year. The editors there have a lot of first-person games to choose from, of course. Dishonored is the fourth announced first-person game from publisher Bethesda Softworks out of an announced game line-up of… four games. When is it not raining first-person games? In the winter and spring of 2011, Sony sold Killzone 3 and EA sold Bulletstorm, then Crysis 2, all marquee first-person shooters. Valve produced a very different kind of first-person game in Portal 2; little indie studio Timegate tried to get people's attention with the first-person shooter Section 8. In June, the first-person BioShock Infinite earned a pile of Best of E3 awards, while the first-person Duke Nukem Forever earned notoriety. The probable best-selling game of 2011 is the first-person shooter Modern Warfare 3 (though there's a cheering section wishing it could be toppled by first-person shooter Battlefield 3). First-person appears where you don't expect it to appear. I played a Spider-Man game last year that featured first-person boss battles. At E3 I watched Ubisoft show off their first original game for Nintendo's Wii U at E3. It was in the first-person. We ran a story about a new massively multiplayer online game today. The MMO is first-person. I played a new iteration of Galaga yesterday. Guess what? First-person. These stacks of first-person games invite mockery and cynicism. Cracked has a two-year joke running about how the games of E3 all look the same: all grey and brown, shot from the first-person with a barrel of a gun poking into the game world. Two things are conflated here: the swelling number of first-person games and the popularity of shooters. In that latter category also go third-person gun games like SOCOM 4, Gears of War 3 and a battalion more. All these shooters turn the avid gamer into someone who fires virtual bullets with the regularity that the average person exhales. All these shooters aren't alike, though. Gears of War usually has clever campaign level design; Bulletstorm lets you briefly control a dinosaur; Section 8 lets you drop into a battlefield from high altitude. The outsider will see no great distinctions in the gray shooters; the aficionado will see a collective nudging and improving: the cover system of the Killzones, the intent for narrative surprise and varied use of color in the Modern Warfares, the constrained weapon load-outs of the Halos all furthering an advance to some shooter ideal, and so many more features of their single and multiplayer designs. All those good ideas and copying of good ideas and improving of good ideas is the iteration and repetition that breeds innovation and elevates tomorrow's quality. It's all competition as an engine of progress, a good capitalist would say. It also can rut conventions, of course. The aficionado frets over map design and worries rightly that shooter games' campaign levels have become funnels and straight lines, that player choice risks being obliterated as if it's just another red explosive barrel. Our topic, however, isn't the shooter, despite its noisy tendency to get attention. 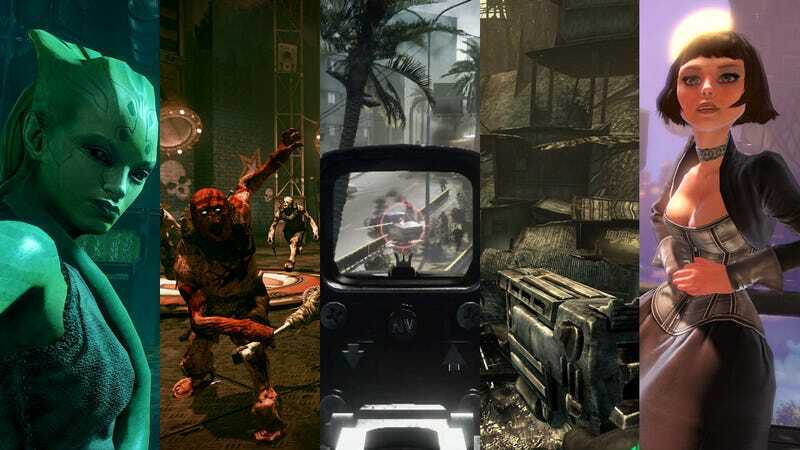 The incessant surge of the first-person shooter further makes the surge in all first-person games more pronounced. But even if first-person shooting ebbs as did fighting games and flight simulators, the spread of first-person games seems less likely to recede. What games do most is what they often do best. We see an increasing number of game worlds through the lens of virtual eyes. Where once we were primarily puppeteers orchestrating the moves of Mario and Sonic as if our controllers were the handles of marionettes, we've lately gotten into the heads of so many video game characters. This once was a trickle of first-person experience, then a stream before our modern flood. We were in the head of the hero of Doom nearly two decades ago, and inside the head if a tank commander a decade before that in Battlezone, so the first-person experience is not novel. It's merely nearly universal today. It is the mode of expression of gaming's Michael Bays, the makers of action-shooting stuff like Call of Duty and that of some of its most celebrated experimenters like Valve—makers of first-persons Team Fortress 2, Left 4 Dead, Portal and Half-Life—and of Jonathan Blow, whose celebrated side-scrolling Braid will be succeeded by the apparently first-person The Witness. First-person is used in many of the current generation's most popular role-playing games: Fallout 3, Oblivion and, the anticipated Skyrim (all products of Bethesda). First-person is used by Irrational Games in their BioShocks as they advance the sense of presence a player has in the unique worlds they create. First-person's main advantage is that it brings us closer to the action and to the scenery. It puts us on the ground rather than hovering slightly above it, and so it allows the sky and the earth to be more visible in proper proportion. We can see a game world as the army man or elf lady inside it might see it. First-person gaming, however, often fails to be what first-person is in prose. It is sometimes a vehicle for an individual's self-reflexive expression, but that is not guaranteed. A first-person memoir suggests that the "I" of the book was the controlling creator of that work. That's not the case in video games, whether one imagines the controlling creator to be the game's developer or player. A first-person novel, to its reader, is a book that should make its lead character more identifiable to the reader. The first-person voice in a novel improves our chance of understanding and experiencing who the protagonist is, of knowing what they know and smelling what they smell. These configurations are not a given in first-person games. They are, in fact, a rarity. While first-person gaming has granted me a greater intimacy with the virtual places in which I play, it's not given me the intimacy of identity that the "first-person" phrase would suggest is possible. Rarely have I felt, while playing a first-person game, that The Guy In The TV Whose Hand I See Holding The Gun is me. Nor have I felt that I am him, that I am specifically someone else, role-playing as a personality that I am not. It seems to me, in fact, that it is in third-person games where I am more aware both of myself and of the identity of the game's lead character. From that removed perspective I feel a sharper sense of both who she or he is, and I have a better perception of how my actions may be influencing them—how much I am putting myself into the game. The most identifiable and distinct gaming protagonists remain the ones seen in third-person: Rockstar's John Marston and Cole Phelps, from Red Dead Redemption and L.A. Noire, for example (Rockstar's next game is in first-person, by the way.) The most malleable vessels for letting players put themselves in games often are still those seen in third person: Commander Shepard in BioWare's Mass Effect series, for example. First-person games, I guess, are not yet the first-person experiences I could imagine them to be. If this is the limit of today's first-person games, it is also its frontier. Because, as with sequels and shooters, the odds are that the crowd of people making first-person games will push each other into making better and evolved games, tweak by tweak, radical change by radical change. Today, the first-person advantage is most prominently in the visuals, in the ability to make a video game player feel like I Am In There. (My brother, always switching to cockpit view in any game that had the option, has long called it "reality mode.") First-person is a powerful lens that best focuses on the special transportive power of video games, to bring us somewhere else and let us do something there. It is the camera angle that, literally, gives the clearest, least-blocked view of the action. First-person in video games is a visual argument that our games should make us actors, not directors. It suggests that being the star on stage—seeing events through his or her eyes—is more fun, more immersive, and maybe more representative of what a three-dimensional video game can be. As for Dishonored, that fourth of four first-person games from Bethesda, I'm optimistic. It comes from developers who have tried to do hard things in first-person with player choice and close-quarters action. Game Informer reports that Dishonored is "a game about assassination where you don't have to kill anyone" and "a game about morality and player choice where the world you create is based on your actions, not navigating conversation trees." It has as much promise as those three other first-person games coming from Bethesda: Rage, something new, finally, from the studio that birthed Doom; Prey 2, a futuristic bounty-hunter simulator; and Skyrim, a game that marshals first-person to let us talk to giants and slay dragons. That last one, Skyrim will let us switch to third-person if we really must. These days, who would wants to switch out of first-person?